improved cohesive UI, nice themes, integrated social cloud services like Flickr, Picasa, Facebook, Twitter; free version available. Let’s create a situation. You have recently married to a beautiful girl and the reception party was awesome. But due to some important work, some of your close relatives couldn’t manage to arrive at the venue and had to stay at office. Then, you want to show them your bride as well as the party snaps but sending them all the copies by post isn’t the right choice neither is to call them all and have another party (expensive!). Then, what options do you have left. Sharing your images via Facebook or Twitter is okay but not perfect as compared to the original prints. Also, you miss out on that photo-book experience. So, if you have one planned in the near future, we have something you can look forward to. 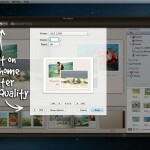 The ‘something’ we just mentioned is the new Mac app, Photo Album 2 that has been developed by Flipping Book. 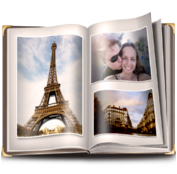 Yes, it’s the second version of the app, Photo Album which has already been quite successful. The app has recently been released and leaving what it offered back then, we’ll be taking on what we’re going to get next. Let’s have a look at its offerings. 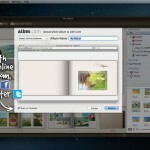 Photo Album 2 also utilizes the same online hosting website albm.com for uploading your photos and publishing albums. It is the online store where all your albums are being stored for sharing. You need to first register with them and then use the same account on your app. Photo Album 2 allows you to take your pictures not only from the phone library but also from other social cloud services including Flickr and Picasa. Just sign in to any of those services from the app itself and take them directly to your photo album. 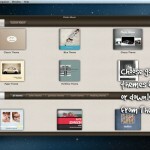 You can select any of the given themes and layouts and select which one suits best before publishing your album. Also, you can use the scaling tools as well as some filters including Black/White, Sepia, Posterize to further modify your photos as a finishing touch. The UI of the app has been revived and is surely better than the previous hard wooden structure which had multiple themes running on the same page with no similarity. While the navigation features are same, it is nice to have a nice cohesively meshed up UI. While the new version has definitely made some better changes over the former, it still lacks that complete package we missed out in the first. There are very few editing tools with no frames provided and though filters are there, they are not just sufficient enough for a photo album to be shared on Facebook and Twitter with your friends and family members. Also, the templates are predefined so that we can’t manually drop our photos in the given space and arrange them ourselves. The app comes in both free as well as paid versions. While the free one gets you 100 pages of album, the paid version takes your access to 300 pages with four downloadable themes from the theme shop. You can also print your albums and get support for PDF. 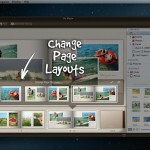 Though the regular price of Photo Album 2 is $19.99, it is now available at a promotional price of $14.99. So hurry before it reverts back! You can also get its Free version download.